Learn About Open Science Badges! The Open Science Badges program was created by members of the Open Science Collaboration to reward authors for enhancing the transparency, replicability, and overall quality of psychological research. All authors of scientific research are encouraged to adopt the following open practices for their research submitted to Psi Chi Journal and beyond. 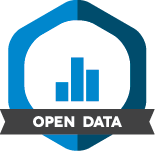 To be eligible for this Badge, authors should create a free account on the OSF website and post all digitally shareable data necessary to reproduce your reported results. This allows future researchers to review your work and compare it to their other findings. Keep in mind: some data cannot and should not be posted due to issues of confidentiality or other ethical concerns. A data dictionary (e.g., a codebook or meta data describing the data) must include sufficient descriptions for an independent researcher to reproduce the reported analyses and results. Here’s an example of an open data submission. Authors who provide all necessary materials to enable future researchers to replicate their research are eligible to receive this Badge. Authors with additional materials not published in their manuscript may create a free account on the OSF website where they can visit “My Projects” to post these materials there instead. For any previously published materials that are prohibited from being freely reposted due to copyright law, please provide a citation or link to the original sources where those materials can be found. Here’s an example of a study’s Open Materials submission to the OSF website. Badge eligibility does not restrict authors from reporting results of additional analyses. When preregistering, include a description of (a) the research design and materials including planned sample size, (b) motivating research questions or hypotheses, (c) the outcome variable, and (d) predictor variables such as controls, covariates, and independent variables. To receive a special Preregistration+Analysis Plan Badge, authors may also preregister their analysis plan by specifying the variables and analyses that will be conducted. Here’s an example of a preregistration. In addition to the three OSC-approved Badges, Psi Chi also proudly offers the opportunity for authors to apply for a special Replications Badge. This badge rewards all authors’ who sought to retest the work of previous research, which is crucial for improving the dependability of psychological science as a whole. Manuscripts do not have to be 100% replications to qualify; it is only important that they accurately replicate certain areas within past research. Manuscripts do not have to uncover the same results as previous research to qualify. Here’s an example of a replication study. We are looking for doctoral-level faculty in psychology and related fields who are passionate about educating others on conducting and reporting empirical research. Please contact our Editor, Dr. Debi Brannan, if interested.